Escape from the heat in one of the two pools and enjoy a relaxing day away from the hustle. Little ones will have a blast on the children's splash pad. Order a delicious cocktail from the pool bar and soak up the sun. The fitness center allows you to keep up with your workout routine. 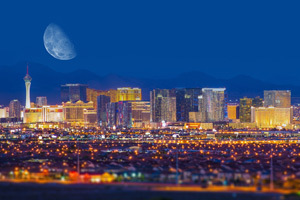 All of the excitement of the world-famous strip is only 1.2 miles away. Don't miss the Bellagio Fountain show – you can see it right off the Strip. Go for a ride on the High Roller, one of the world's tallest Ferris wheels. It's only 1.8 miles drive to Wynn Las Vegas. Test your luck. Wyndham Desert Blue is conveniently located in the heart of Las Vegas, just a short drive (or shuttle ride) from the Strip. Make a pit stop at your condo to get changed into swimsuits – don’t bother unpacking, there's time for that later – spray everyone head-to-toe in sunblock and get ready to hit both of the outdoor pools. Go for a swim or relax with a refreshing drink from the poolside bar while the little ones play on the children’s splash pad. Up for a workout? Let the kids hang out in the game room while you get your cardio on at the fitness center. One-bedroom condos sleep four guests and feature kitchenettes allowing you to prepare basic meals (or heat up leftovers). For more space and more amenities, check out the deluxe one- and two-bedroom condos, they sleep four to six guests. You’ll have the freedom to whip up anything from quick snacks to a four-course meal thanks to your fully-equipped kitchen. If things get crazy, you’ll have an in-suite washer/dryer. Throw in a load of laundry while you catch a sitcom rerun on the flatscreen TV with cable or watch a movie on the DVD player. Once the kids have fallen asleep, enjoy a relaxing soak in your jetted tub. Wine optional – but recommended. Wyndham Desert Blue offers a free area shuttle. The Strip is the main attraction of Las Vegas. It’s lined with hotels and casinos and is the heart of all of the action. Go for a ride on High Roller, the giant Ferris wheel on the Strip. It provides three hundred and sixty degree views of Las Vegas from over five hundred feet in the air. For a grownups-only adventure, try an “Open Bar in the Sky” during Happy Hour. Shopaholics will love the Forum Shops at Caesars Palace. Known as “the Shopping Wonder of the World,” it features over one hundred and sixty specialty stores and restaurants. Stores include Burberry, the Apple Store, Gucci and Louis Vuitton. Hungry? Dine at The Cheesecake Factory, Carmine’s NYC Family Style Italian Restaurant or Border Grill. The Bellagio Fountains are a water, music and light show that features Broadway, opera, classical and pop music. The show spans one thousand feet and is almost five hundred feet tall. Every performance is unique, so even if you’ve seen it before, it will always be a brand new experience. I haven’t even told you the best part – it’s free!